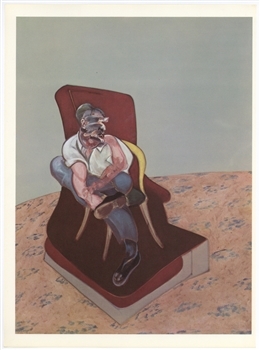 Francis Bacon lithograph "Lucian Freud"
Medium: lithograph (after the painting). Printed in 1966 for Derriere le Miroir (issue number 162) and published in Paris by Maeght. This lithograph was done after the Francis Bacon oil painting that was executed the same year for a Paris exhibition. Sheet size: 15 x 11 inches (380 x 278 mm). Not signed.